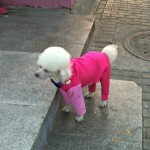 « Day 291 in Beijing: Whip It. Whip It Real Good! 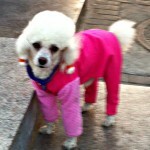 Day 292 in Beijing: And Even More Doggies! Yes, you can say I’m addicted to cute dogs. I was walking over to meet Jill and another friend and noticed this cute little guy. It was a bit cold and windy so he was bundled up tight. It has actually been a warm winter, from what I’ve been told, and Spring definitely seems to be in the air. Winter is just giving us one last blast of cold. In fact, compared to when I took this picture, about 7 days ago, it is gorgeous, sunny and warm. I don’t even need a sweatshirt right now to go outside which is drastically different from a month ago when I needed my jacket, hat, scarf and gloves. The pollution also seems to have decreased as the coal plants that power the heating in the apartments and buildings are now shut off for the year and producing less smog. All in all, this is a great start to the year and I can’t wait for April! I’m pretty sure this little guy would agree. I’m guessing he is embarrassed.